Water heater repair or replacement is a painless procedure in Lee County with the help of Diversified Plumbing Services. Our certified plumbing technicians offer the expertise and experience to provide you with the best products and installations. We carry and install the most energy efficient and reliable water heaters on the market — which is not only good for the environment but ultimately saves you money. We offer conventional electric and gas hot water heaters (storage tank). We also carry on-demand or tankless (instantaneous) water heaters. Water Heaters are not all we do, but we are very good at it. 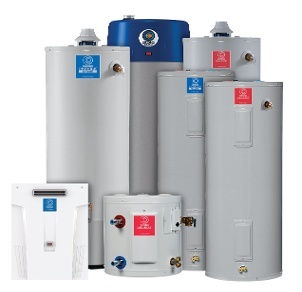 Our employees are factory trained experts in water heater installation and repair. Does your water heater rumble? Does a rotten egg smell come from the hot water? Is your water heater not producing enough hot water? We see these problems every day and we can advise you in the least expensive correction for your water heater. We install water heaters and we repair them. We are proud of our reputation for professionalism and we strive to maintain the highest standards. If your water heater fails, call us! The solution is just a phone call away. Your water heater needs to be professionally installed for optimal performance and energy efficiency. With state-of-the-art technology and an expert staff of plumbing specialists, we have the tools to tackle any job, big or small, residential or commercial. We use the best water heaters on the market including A.O. Smith, State and REM. Our experience and relationships with these manufacturers allow us to offer all parts and labor at unbeatable prices! Your project will be supervised from consultation to cleanup to ensure your complete satisfaction with the process, and our plumbing contractors will work around your schedule. Call Diversified Plumbing Services for a free water heater installation quote for your home or business.